In the late nineteenth century the general consensus among scientists was that science and technology had almost reached its apex. Knowledge had replaced spirit. Man in his intellectual smugness thought he had all the answers. But as the twentieth century progressed it became apparent that science could not unravel all of the mysteries. In fact if anything, the advent of scientific achievement only created more wonder and questions. The more so-called knowledge we acquired, the more we realized that we hadn't even scratched the surface. When I first began training in the martial arts, I always asked questions. Alot of questions. The higher ranks didn't seem too perplexed with anything, I figured they already knew the material. But as I continued to train and research, I found the well to grow deeper and deeper which I found to be a bit disconcerting, if not downright annoying. "Technical shipwreck" was a term Draeger used to describe what happens when a student gets too bogged down with details. I've endured some brutally hard training sessions, but on more than one occasion I've left the dojo feeling like my brain was on fire. I've noticed that smart people tend to do well in the martial arts. Kids that do very well in regular school are quite often the target of bullies, if for no other reason because they're such good students. But ultimately, brute force is no match for the intellect if you know how to play it right. Knowledge really is power. It is said that the great masters were always thinking about their art; imagining fight scenarios with one or more assailants, armed and unarmed. Has anyone ever practiced kata in their heads while at work or home? Einstein conceived many of his theories in physics using gedanken (thought) experiments, usually during reposeful moments. Meditation can work wonders for solving certain problems that seem insoluble. Earning a black belt is often equated with getting a high school diploma. The analogy then is that the subsequent ranks (dan) become like college and post graduate degrees. A few high ranking instructors have actually taken the title of Professor, as opposed to the Japanese equivalents of Hanshi or Shihan. Even they still regard themselves as students. Learning never really ends. As Einstein once noted, knowledge is alright - it's discovery that's really fun. I've woken up thinking about karate. This is what is so amazing about the martial arts. Your training never ends, the knowledge you gain is also never-ending. Now that I have attained shodan I am feeling so overwhelmed about what to learn next, how to apply it to my training and also to my everyday life. I love that feeling!! Being overwhelmed and being able to breathe into that...ah, it's just food for the soul. I am constantly doing kata in my head, as I drift off to sleep at night, when I'm driving, when I'm watching TV even. Because Shodan testing is getting closer, I've been trying to force myself to imagine attackers and take care of some bunkai issues in my head. Hopefully that will help! My sensei equates getting a black belt with the completion of kindergarten. Now you know your ABCs, it's time to start learning to read. I've practiced mental kata many many times in various circumstances. It gets me through a boring day at work, a dentist visit, and my annual mammograms, among other things. I think you are very correct on this subject. My instructor, a 4th dan, often tells me that women, in particular, tend to ask more questions and "think too much" (and this is coming from a fellow woman, no less). It's probably because women are taught to be more thoughtful in what they do, so by the time they start learning this information, they tend to ask more questions. Heck, for me, I'm about to get my 1st dan in a few weeks, and I still ask a lot of questions. I'm sure I still will as time goes on. I'm the type who has to understand why you do it, because there's always a logic to why something is the way it is, and if I understand that, then I tend to do the move better. This is probably why, also, the MA schools promote the idea that children tend to do better in regular school is they take karate/TKD/whatever at their dojo. The kids' brains are challenged to think about what they are doing, and flexing those brain wrinkles must help in school as well. It wasn't weird. People change, that's all. Did they give you a date for your shodan test? And how's that Seisan kata coming along? My sensei equates getting a black belt with the completion of kindergarten. Must be a kindergarten for prodigies! Using mental imagery for kata while getting your teeth cleaned. Now that takes concentration! My instructor, a 4th dan, often tells me that women, in particular, tend to ask more questions and "think too much". Actually, I've heard that men "think" or rationalize, where as women tend to feel or be more intuitive. But I understand where you're coming from, because I've trained with female instructors and black belts who are quite cerebral when it comes to karate, undoubtedly to make up for their size and strength differences. I'm with black belt mama on this one. I used to to katas in my head while driving until I realized I couldn't remember how I got from point A to point B.
I'm definitely the analytical one at my dojo. My sensei is fascinated by other people's analyses, but generally doesn't offer very many of his own. I think some of the difference is simply in formal education level - I've had so much schooling, I analyze everything pretty much automatically. This is a great help in some things, and a hindrance in others - having your analytical side kick in mid-fight is a great way to freeze up and lose! The analogy for shodan I like best, is that it's like having learned to read. You think you're done, but what's really happened is you've just gained access to a whole new world to learn. Regarding a date, I'm supposed to test in February 2008. However, testing is going to be 1200 miles away, so I either come up with a flight ticket and accomodations or I wait until July '08. I'd like to go in February since that's the date I've been focusing on for years now. I used to to katas in my head while driving until I realized I couldn't remember how I got from point A to point B. That still sounds a lot safer than driving while talking on a cell phone! My sensei is fascinated by other people's analyses, but generally doesn't offer very many of his own. Very smart. A good way to get a students out of mental lethargy is to make them think for themselves. This obviously applies to intermediate and advanced levels. Isshinryu's Seisan uses some of the dynamic breathing as well. 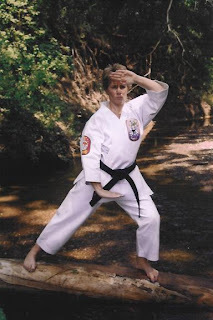 It's true that old school karateka would spend months and even years on a single kata. Reminds me of a story that's credited to Chosin Chibana, a 20th century Okinawan karate master. At the age of 80, he still felt that he had 'a long way to go' in his pursuit of karate perfection.